Early bloomer. Small white or pink flowers, 5 petals, umbrella-like leaves. Edible, cooked or raw; also many medicinal uses. 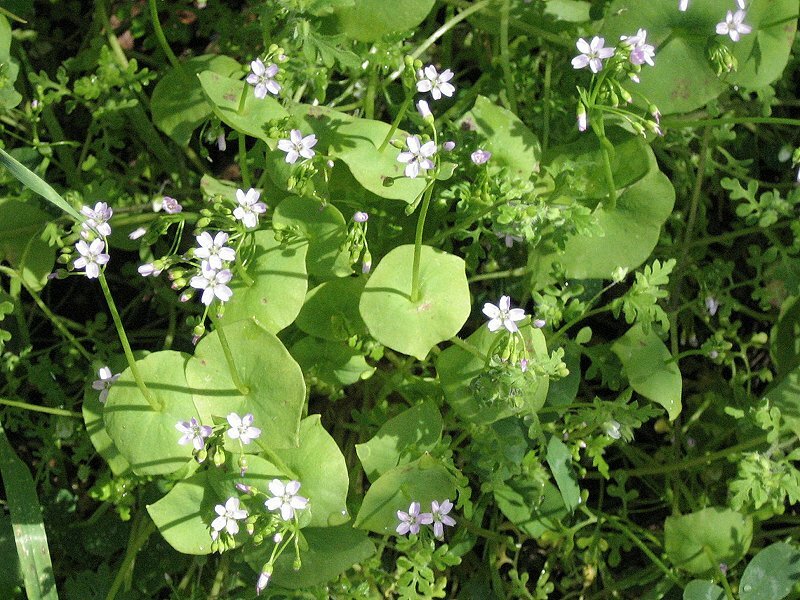 Notes: Also called Winter Purslane. Formerly called Montia perfoliata. A native and member of the Purslane Family (Portulacaceae). It was named after John Clayton, a colonial American botanist. Perfoliata means: through leaf, because the flowers "perforate" through the leaf — see photo below. This genus has 28 species in North and Central America, and eastern Asia. It prefers shaded, moist areas. Miners ate it. Leaves and stems can be eaten raw or boiled, best eaten when young. Roots are also edible. It is a good source of vitamin C. It is now grown as a delicacy in Europe — a gourmet salad green, and also eaten cooked, like spinach. The Indians used the leaves as a laxative tea. The black seeds are a food source for birds. Species Claytonia perfoliata Donn ex Willd.